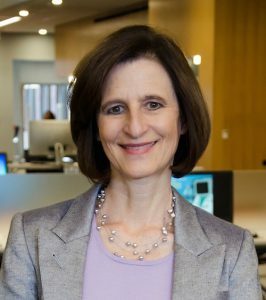 Mary Ann Mavrinac has served as the vice provost and Andrew H. and Janet Dayton Neilly Dean of the University of Rochester Libraries since June 2012. From 2001 to 2012, Mavrinac was the chief librarian at the University of Toronto Mississauga, where with many people and many teams, she led from vision to occupancy a new, award-winning academic library, the Hazel McCallion Academic Learning Centre, which opened in 2006. She recently led the development of a 10-year facilities and master plan for the Rush Rhees Library aimed at transforming this iconic space for 21st century learning and scholarship. Mavrinac was the 2010 president of the Ontario Library Association (OLA). In 2014, she was honored with the Ontario College and University Library Association’s Lifetime Achievement Award. She has been on the board of the Association of Research Libraries since 2013, assuming the role of President (2017-18), and is currently serving as Past-President. Mavrinac holds a B.A. and B.Ed. from the University of Toronto, an MLS from Western University, and an Ed.D. in educational leadership and change from Fielding Graduate University.